UPDATE – FDIC Units Sold and Available for Purchase!! Shores of Panama Condos went up for bulk auction of the remaining 320 units on May 5, 2011. 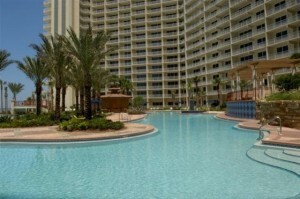 The Shore of Panama in Panama City Beach is a 709 unit luxury beachfront condominium. In addition to the 320 units, the Club business operations, shared rights to structured parking and common areas and amenities. The Shores of Panama is a 23-story condominium development is located directly on the beach with direct Gulf views from all units. 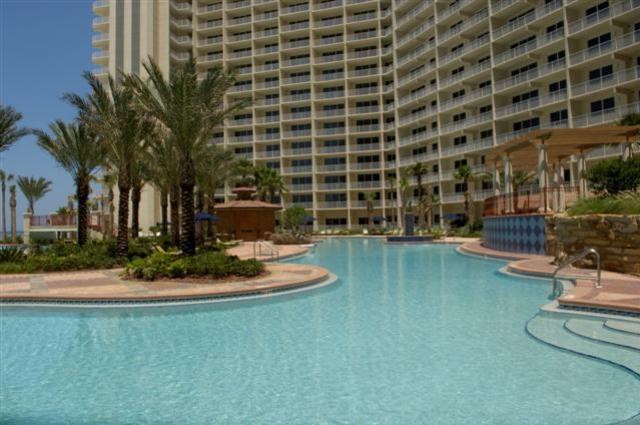 The property is located on the east end of Panama City Beach, Florida, one of the nation’s top beach destinations. The property features more than 450 feet of beach frontage and The Club, a resort-style amenity package that features an exotic outdoor pool with fountains, indoor heated pool, two tiki bars and two spas. All units feature granite counter tops and tile flooring in the kitchen and baths. Shores of Panama was built in 2007 and this auction of 320 units represents 349,542 total square feet of finished units of the original 731,753 square feet. The average unit size of a Shores of Panama Condo is 1,092sf. 50 Units will be sold furnished and are currently on a rental program. This is the second bulk auction for the Shores of Panama. On March 5th, 2009 Silverton Bank was the only investor to bid on the first auction. Their bid of $68.7mil was accepted by the Bankruptcy court of the Northern District of Florida. One year later Silverton Bank was taken over by the FDIC and we now have a second bulk auction for the same developer units. I am confident that this second auction will be successful and a new release of the Shores of Panama units are restructured pricing with be a much needed infusion to the health of this luxury condo. We have seen many condos go into bulk sale and done correctly the results are outstanding. Redfish Village struggled with financial issues and the development limped along with stagnant condo sales. In April 2011 Patten Sales and Marketing LLC released 53 units from a bulk purchase of the foreclosed units. The development has stabilized, we have new owners, HOA has stabilized and the commercial property will regain its footing and be successful. It is too soon to tell what the future holds for the Shores of Panama. Right now I am recommending a “Hold” on purchasing units at the Shores of Panama unit or “Purchase with Caution” until we can assess the impact of 320 developer units coming on the market. Most likely the developer units may sell slightly above the current distressed inventory pricing, but with much less risk as the units will have an approved financing program, a stabilized HOA and a clear road map of the long term viability of the unit. The Shores of Panama is a fantastic development and the new investor has the power and potential to turn this condo around in the right direction. Once this happens, the Shores of Panama will be an excellent investment. If you would like to be alerted when the Shores of Panama Bulk Sale Units come onto the market please email info@teambaranowski.com or call us at 850-583-1640. Click HERE to get the latest update on the Shores of Panama FDIC units available for Sale Updated MAY 2012. The FDIC units that were auctioned off by the FDIC in May 2011 and finally available for purchase and being offer to the public. It’s hard to find your website in google. I found it on 21 spot, you should build quality backlinks , it will help you to rank to google top 10.